So, I know that I’ve said this multiple times already when it comes to the pages of our alphabet book, but seriously, this lowercase letter F craft is probably one of the easiest that you will ever make. Even then, this letter F flower is still a fantastic way to work on scissor skills with your preschooler! As with all of the other letters, you can either cut the letter out free hand or use a template and trace it if that would make it easier for your child to cut it out. From the green construction paper, cut out your lowercase letter F, cut a small circle to fit in the middle of your flower from the yellow, and cut your actual flower from the pink (or whatever color you decided to use). For our craft I drew a flower shape on the pink construction paper and had my little cut practice his scissor skills by cutting it out. Unfortunately, our flower was ruined shortly after by a spilled water cup so we had to create a new one half way through. To create your flower, glue your letter F onto your sheet of card stock and add the flower to the end of the loop at the top of the letter. Finally, glue your yellow circle right into the middle. Once your glue had dried, just use your hole punch and add it to your alphabet book if you’re keeping them all together. 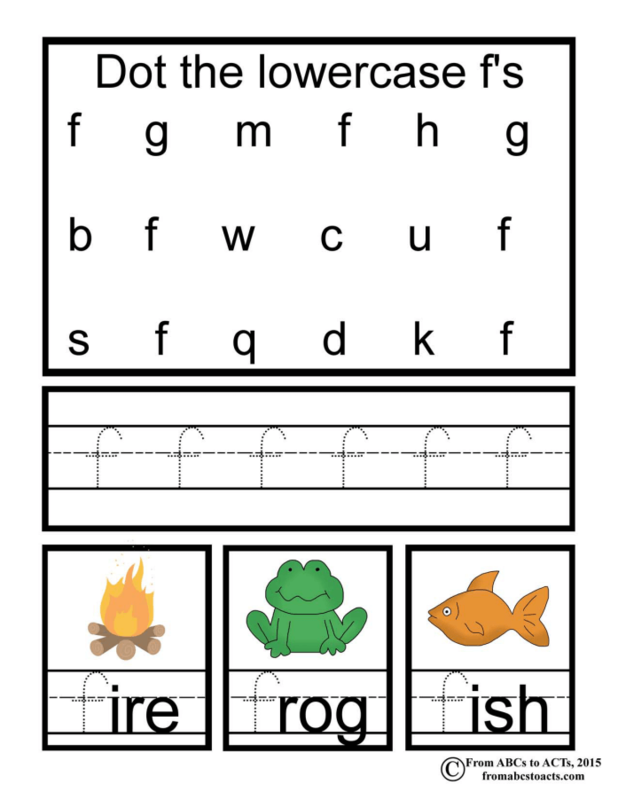 For some lowercase letter F practice, grab the printable alphabet sheet below, some Do-A-Dot markers, and your crayons and have fun! Add both pages to your book and you’re good to go!